We know that Messiah Yeshua (Jesus) did not meet the expectations of the Pharisees at His first coming because they were jealous of Him and focused on a victorious king, "Mashiach ben David", one who would rule on the throne of David, bring judgment to the wicked and restore the Temple and the Kingdom to Israel. So, to this day, Orthodox Jews anxiously await Messiah's arrival, believing he could come at any time. 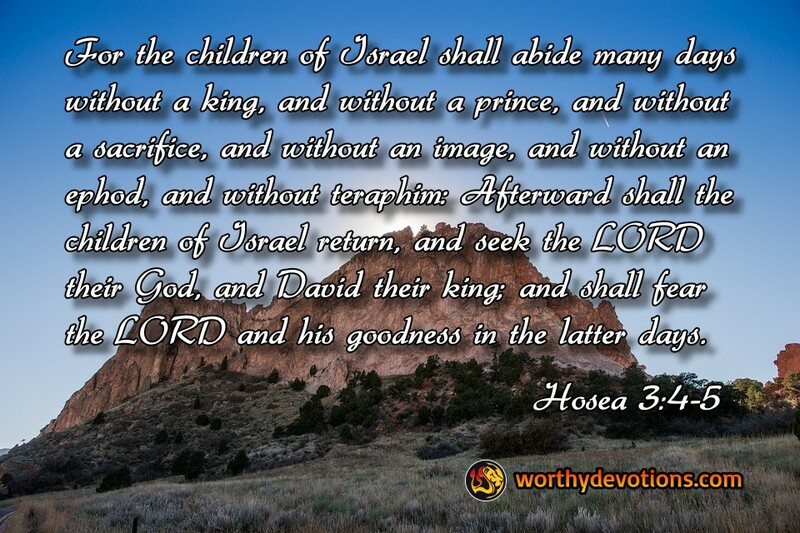 Now this important prophecy in Hosea, often overlooked, speaks of a period of time for many days when Israel would be without a King, or Prince, or a sacrifice, or other religious articles -- but that in the latter days (the Hebrew literally means "the End of Days") the nation will return, and seek the Lord and the Messiah -- specifically "Mashiach ben David" -- the Messiah Son of David. This time period began with the destruction of the Temple in 70 AD and continues to the present. But even having missed the first coming of the true Messiah, still, the Jewish people nourish a continuing hope and expectation for His coming, which is included regularly in their liturgy. Enduring exile and persecution over many generations they have continued in the unwavering hope of his coming. In light of this example of persevering hope among the Jewish people, how much more expectant and hopeful ought we to be who already truly know Him who is coming again for us...and for them? He who was resurrected from the dead -- Yeshua, the "hope of glory"! As the earth continues to groan, and so do we, let's keep our focus where it really belongs. He is coming soon. Even so, Come Lord Jesus! Follow in the footsteps of Messiah!